Great summer skin starts at the spa. If only a trip to a haven like Oasis Day Spa was possible every day of the week. Life would be relaxed and our skin, quite frankly, would look amazing. Of course, that's not possible unless you're lucky enough to work in such an environment or have retreats scheduled on a regular basis. We spoke with the spa's Skincare Director, Kate Weinberg, to get the much-needed scoop on how to get the skin in great shape for summer! LTK: Let us live vicariously through you for a moment. Talk us through a day in the life of a skin care director at an indulgent spa. KW: Being Skincare Director for Oasis Day Spas is an exciting role. 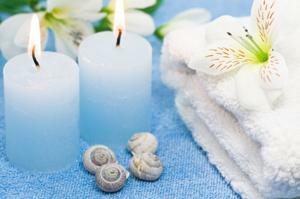 I am always on location at our spas to advise our guests and our therapists. On a daily basis, I am either consulting with skincare goals, creating new treatments (my favorite) or representing Oasis for our many television and Web appearances. The best part of my day is knowing that I work for a company that allows people to feel better and in turn look better. It is a gift! LTK: Summer is just around the corner, which means there'll be plenty of skin on display! What services do you offer that are specifically tailored to get the skin in great shape for the season? KW: Summer ready skin is best achieved by body bronzing! At Oasis Day Spas we start our service by doing a thorough full body exfoliation. After your skin is smooth, we apply St. Tropez tanning lotion. The treatment not only leaves the skin glowing, but it detoxifies the body and helps reduce the appearance of cellulite (yes!). LTK: For those who aren't in the area, what are your recommendations for pampering at-home treatments that may yield similar results? Any tried and true tricks of the trade? Exfoliate from head to toe using a sugar scrub to remove all flaky skin cells. After towel drying, apply moisturizer to heels, knees, elbows and toes. These are places tanner loves to settle and look grungy. Apply tanner in a circular motion, making sure your entire body is covered. Be careful not to massage too aggressively, because that may cause streaking. Air dry for at least half an hour before dressing. LTK: How do the results of a spa bronzing session differ from a bottled tan or even a traditional suntan? How long does a spa tan last? KW: The results are totally healthy, totally even toned, and should last you approximately four to seven days. LTK: Bikini waxes are an important part of many women's regimens, but they can also cause serious pain! Any tips on how to diminish the discomfort? KW: We carry a great product called No Scream Cream at Oasis. It's applied 45 minutes before treatment and it numbs the area enough to reduce the pain significantly. Do not take aspirin or Tylenol prior to waxing, as this may contribute to bruising and bleeding because it thins the blood! LTK: Exfoliating eventually sloughs off a tan, but it's also great for the skin. Is it a bad idea to exfoliate daily or even every other day while following a tanning regimen? Is there a tanning "schedule" that should be followed? KW: If you are trying to maximize your tan, I do not recccomend exfoliating daily. Give yourself a thorough exfoliation prior to self tanning. After a few days, gently exfoliate with a pouf and reapply tanner. Every three days is a great schedule to maintain glowing results! LTK: What are your recommendations for oily skin? Makeup has a tendency to just melt during the summer, resulting in an endlessly shiny face. KW: Don't over dry your skin by using harsh products…this will make your skin overcompensate and produce more oil! Use a gentle cleanser, hydrating toner and oil free SPF. Blotting papers work wonders to soak up oily spots so you won't have to keep reapplying makeup.